2012 Election: Phi Alpha Theta Edition! Last night was a very important night for America. Every TV was tuned in to CNN or Fox, waiting for the results of the election. Every person had their fingers crossed with hope that the president they voted for would win. This was no different for me. Last night, I gathered in the EAC with a whole bunch of fellow students for Democracy Rocks!, an event put on by Phi Alpha Theta and Late Knight! What a fun and successful event it turned out to be! Phi Alpha Theta, our history honor society, has been working hard this semester, putting on debate watch parties and holding their very own debates! Unfortunately, I have had class during all of their debates, but one day, I will get there! At Democracy Rocks, Phi Alpha Theta brought together different student groups that held election related activities throughout the night! Spectrum put on election trivia, B.A.S.I.C. hosted election bowling (which.. not to brag or nothin’, but I may have won some great cupcakes! :D), and Environmental Club had a board of facts about the candidates environmental/green plans! There were musical performances by our very own Girls Next Door and Brian Jay, as well as a D.J.! 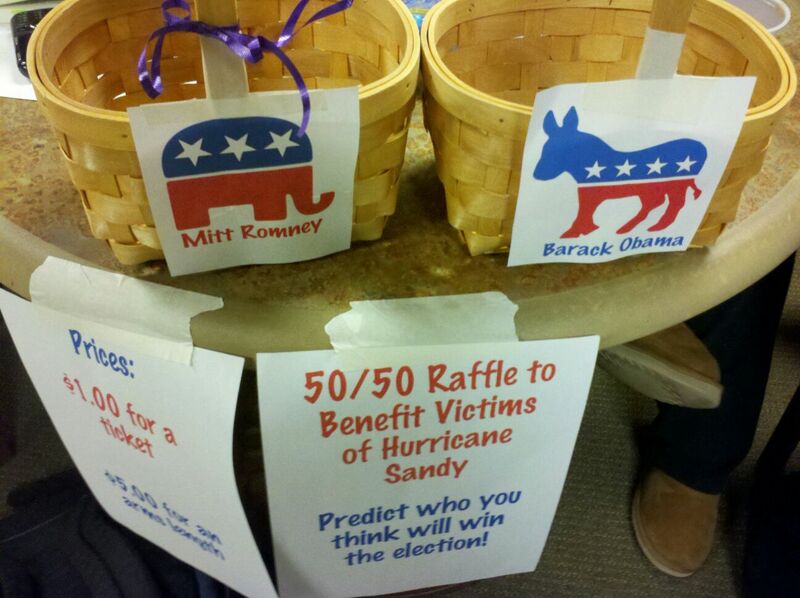 Phi Alpha Theta's 50/50 Raffle! Half of the proceeds were donated to Hurricane Sandy. Overall, last night was very fun! It was the first election that I had ever voted in! It was a very big deal for me. I called my mom as soon as I sent my absentee ballot in, freaking out, exclaiming “OBAMA 2012!” I voted! My opinion mattered. It is honestly a great feeling! After the election was over, and I gave out my sigh of relief, I decided to follow politics a lot more closely than in the past. I feel as if I was well-informed for this election, however, I would like to be more informed in 4 years, when my opinion will once again matter on who leads this country. Did anyone else go to Phi Alpha Theta’s event? If so, please share your experience! Was this your first, second, third election to vote in? Tell me about it! I really hope this excitement I feel isn’t the result of novelty effect!